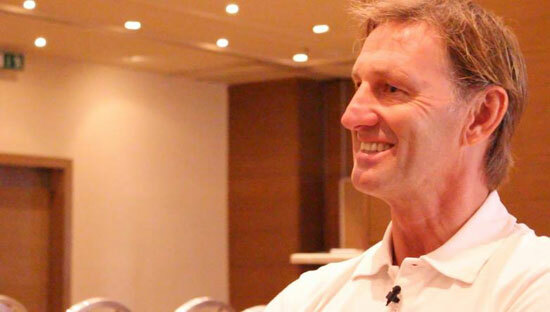 Tony Adams is an Arsenal legend. 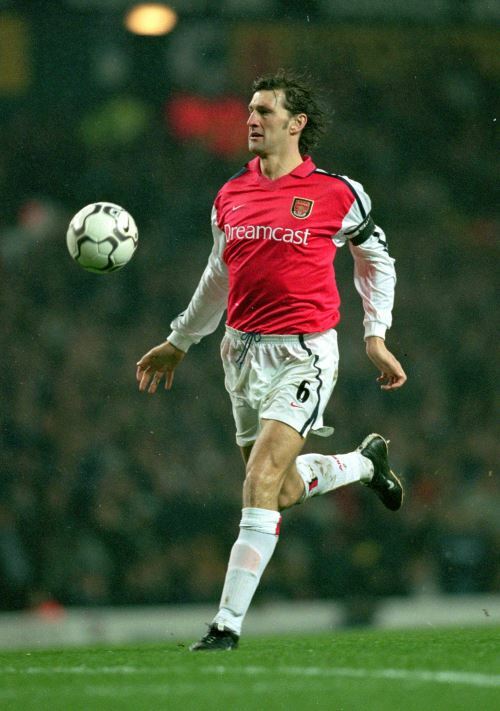 As a centre-back, Adams made a total of 669 appearances for the Gunners, captaining the club for 14 years. A one-club man, Adams formed part of a famous back four at Arsenal, lining up alongside Steve Bould, with Lee Dixon and Nigel Winterburn acting as full-backs. Adams is the only man to captain title-winning teams in three different decades, while he also won three FA Cups, two League Cups and the UEFA Cup Winners' Cup. He has dabbled in management, while he is now working hard at Azerbaijani side Gabala as director of football, aiming to put the finishing touches to the foundations he has built in recent years. 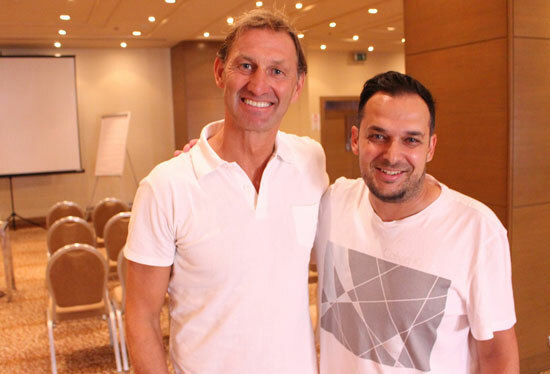 Inside Futbol sent John Georgopoulos for an exclusive chat with the Arsenal legend, who also won 66 caps for England. Inside Futbol (IF): What was your motivation to move to Azerbaijan and work for Gabala FK in the Azerbaijani Premier League? Tony Adams (TA): It’s a fantastic and interesting project and I’ve been here for five and a bit years now. I signed [with Gabala FK] in April 2010 and originally came in as the head coach, but after about 18 months I went to see my president and said that it was kind of wasting my time because the quality of the team wasn't great and at that particular moment my family were living in Baku while I was working in Gabala. Education wasn't particularly great for my children at the time, so I asked the president whether I could take on a different role for him where my services would be more useful and I could spend more time off the pitch. So I then became an advisor to the president and [was asked to] build the [club’s] infrastructure. Pitches, stadiums, contractors from Denmark and Portugal, people who set up the pitches – there is a lot work to do off the pitch and at the same time I advised the president on coaches, players and things like that. I became his advisor, which meant I could be in London and England at the same time. I did that for about two and a half years when I sat down with the owner of the club to discuss his vision of the club. He was very clear in his ideas: The project was to build the best academy in the country, build the best facilities, challenge for the Azerbaijan Premier League title and lastly influence the league through our academy players. I‘ve completed a couple of those and we've got the best academy in the country already. I think about 50 per cent of all Azerbaijan national team players come from Gabala’s academy. The pitches are unbelievable. Six grass pitches, two synthetic indoor arenas, an 4,000-seater academy stadium and a hotel which facilitates teams. So that’s done and we are challenging for the league. Whether we will win the league and challenge Qarabag [who won the last two campaigns] this season, we’ll need to see, so I’ve still got one more thing to do. I developed the team, developed the academy and we brought in Ali Yavash from Galatasaray, who set up the teams at our academy, and then I brought in [former Feyenoord head scout] Stanley Brard. He was tasked with establishing the style of play because the president told us what he wanted. They love Barcelona – well, we all love Barcelona. He wanted to play a passing game, a possession game and Stanley was obviously the man. Johan Cruyff developed total football at Barcelona, my president wanted that – and Stanley was the man to do it. Going back, they made a rushed appointment with the Romanians that were brought in. Poor quality Romanian players and the team were sixth in the table before Christmas last year. He came to me and said: ‘Tony, I need some help with the first team. How do you fancy coming back as a football director this time? It’ll be a bit more hands on and you’ll move back to the country, but be still free to go home and back to England for international breaks.’ The first team needed help, so I came back in January and brought in Roman [Hryhorchuk], a Ukrainian coach, as well as Ukrainian players and I kind of rated the whole process. I was delighted with the coach. He is a magnificent coach, open, honest, willing to listen, willing to change. We have brought in some good players I think, especially goalkeepers and defenders, and on top we won eight games. Last season we came third in the league and this season started very well, while the Europa League matches have gone superbly. It's a big project. IF: What is your main goal at Gabala FK? Do you think the club could reach the Champions League group stage in the upcoming years? TA: Like I said, the aim was to have the best academy in the country, the best pitches and to challenge for the league title. When you are in a country like Azerbaijan, I suppose there are going to be a few challenges for the league title and winning the league with our academy players, then you are going to be in the qualifying rounds of the Europa League and the Champions League on a continuous basis. Whether we’re going to develop enough to actually reach to the Champions League group stage is a very big ask for a small country. I think it's a very big ask for a lot of small nations to be honest when you get up against a tough German or French team. You know, with these kinds of teams it’s more likely you are sometimes going to have some good results, but more often you get undone. We have been fortunate we’ve played a team from Georgia, Cyprus and Serbia so far, so we've managed to progress. Panathinaikos was the first serious opposition we had to deal with. Luckily for me the president didn't ask me to do that [reach the Champions League group stage], so I might be able to get out in time! IF: 14 years as Arsenal’s captain, 669 appearances and ten major trophies in three decades. What was your best Arsenal moment? TA: We don’t even have time for that [to name all of those good moments]. I was very lucky to play for a fantastic football club. I joined them as a schoolboy in 1979 and left in 2002 after lots of trophies and lots of wonderful times. I’m very proud of what I did for them and I think they are very proud of what I did for them. IF: Can you believe Arsenal have won the league only once since you retired? TA: I’ve felt quite upset about this. I’m not going to go into too much detail because they have a fantastic coach and they’re a fantastic club in a magnificent stadium. I think Arsenal have struggled to get the balance right in recent years and this is as far as I will go. I’m saying he [Arsene Wenger] has got a great offensive unit, but I think he is neglecting the defensive side and I think that’s where the problem lies. If they strengthen that area I think they could go and win the league, but I think that’s the error of the team. He sticks to his principles and he wants his team to be offensive. I think he’s not got the balance right in recent years. IF: Why do you think the team of “invincibles” didn’t create a legacy, didn’t win more championships or succeed in the Champions League? TA: When Sol Campbell and Ashley Cole left they were the last of the old guard who understood how to defend and prioritise that department. I think that when they left there was no one else that understood that and the club hasn’t been the same defensively since they left. IF: Do questions need to be asked of Arsene Wenger if Arsenal don’t challenge for the title this season? Or has he done enough to be allowed all the time he feels he needs? TA: Ι’m not going to speak about that. IF: Sure. Moving on, what do you make of Arsenal’s start to the season? Who could make them into a title-winning side? TA: I’ll say it again, I don’t like to speak too much about it. I don’t think they have got the balance right and I think if he put the balance right with regard to their defence/offence he would win the league. It certainly seemed in recent years that whoever won the league had been very good defensively. Chelsea had the best defense last year, before that there was Vincent Kompany at Manchester City and before that Manchester United won with [Nemanja] Vidic and [Rio] Ferdinand. I think it’s an important part of the game which is sometimes neglected – well, I know it’s neglected. IF: Who was the toughest opponent in your career? TA: There were so many over the course of my career. I played for over three decades and at the start there were people like [Marco] van Basten in Holland, who was a complete centre forward, Kenny Dalglish at Liverpool, these kinds of people, when I started in the game. It was a very physical game, yet people like big Joe Jordan and John Fashanu used to knock you about and then the game changed. The ball was played on the floor, then you got quick little ones like Peter Beardsley that caused you problems or incredible little gifted players like Diego Maradona. Zinedine Zidane, these type of people that don’t play like a centre forward they come off more like a No 10, was invented, and Dennis for Holland, Dennis Bergkamp. I think the most complete player that I’ve played against, was probably Van Basten. He was left foot/right foot, 6’3’’ tall and could run like Thierry Henry. He was just a complete number nine for me. He was probably the best I’ve ever faced. 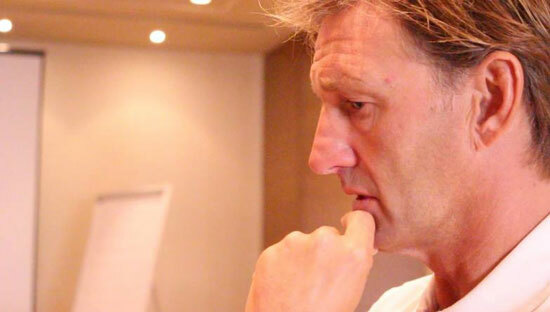 IF: Do you think you’ll manage another club in England in future? TA: I don’t know. I’ve finished trying to plot a career in football management. It’s 50 per cent talent and 50 per cent luck. It’s an impossible industry – I think the average spell for a manager in the English Premier League is one year and one month. I’ve got a very good project in Gabala. I’ve been in football management, coaching and football directing for more than 13 years now. I’m nearly done here [in Gabala], I’m very close. Like I said, I’ve got possibly one or two more years left to win the title here and then I’ll probably be looking for something else to do, but I do like the project. I was at Arsenal for 21 or 22 years and I have been here for six years now. I do like to work with good people and the boss that I’ve got here, the president of the football club, is really sincere, respectful and a dignified human being. I’m proud to work for him. IF: Did you ever consider leaving Arsenal when you played there? TA: A couple of times. Alex Ferguson wanted to sign me twice, just before Arsene Wenger came to the club. I was ready for a change and he was on to me every day. The chairman at the time, Peter Hill-Wood, convinced me that there was a good man on the way and that we were going to be ambitious financially and I found my salary tripled, which was amazing. Arsene came and the rest is history. I never felt the need after that to look anywhere else. IF: How was it to be the captain of Arsenal at the age of 21? TA: I’m the only captain that won league titles in three decades. Did you know that? Ryan Giggs has done it, but not as a captain. I had a big mouth. I was very cocky, but I had the talent to back it up and I wanted to win and was driven. I wanted to be successful at any cost and that’s why I suppose it was a natural progression of being the captain of all my junior teams, Under-21s and the England teams I played in. I think they would have knocked me back if I didn’t have the talent to back it up. I was very proud. IF: Did you feel any bitterness when Glenn Hoddle gave the England captaincy to Alan Shearer in 1996, two years before the World Cup in France? TA: Yes, I’m a human being. I thought he made the wrong decision. I still do, I think I could have done more. I think the team could have done more in France, but we will never know and I didn’t accept his reasons for the decision. But I've been a manager and a coach now and I know you have your reasons for taking decisions. Obviously I accepted his decision and I did my best at the World Cup in 1998. Yes, I got upset and it was a shame because I think I could have done more. IF: What are the English national team missing? TA: Quality players. The English team don’t have the quantity or the quality for me at the moment and that’s definitely worrying. IF: Do you think that English football has lost its contact with the community? TA: I think that at Arsenal, the likes of Kieran Gibbs and Jack Wilshere certainly give a lot back to the community. They are very active in the community, but I can only speak for Arsenal. Education in that area has never been bigger. We used to drink with our supporters. We used to go out after the games, which is a good thing and there isn’t a detachment. It’s always been the case, your buddies from school, the milkman, the postman, were at the match, but they were still your mates. TA: I don’t talk about individuals obviously, but our charity [Sporting Chance Clinic, which was founded by Adams] is 15 years old now and services are available to Kenny and everyone else. We have 35 counsellors and I know Kenny is being looked after by one of those guys. I don’t tend to talk about individuals, but I’m definitely very proud of my charity and it’s available for any person, whether that’s amateur or professional. We treat gambling addiction and substance abuse. We’ve got 35 therapists that deal with depression and numerous problems and we have an educational department in Australia, too. IF: Legendary The Clash frontman Joe Strummer wrote a tune for you in 1999. How often do you listen to this song? TA: I played it to the kids a couple of times. The Clash are a legend, they seem to be from a different era. The kids today probably don’t remember them, but it’s a good tune. IF: Do you think the income that flows into big clubs like Chelsea and Manchester City has changed the game for good? TA: I think your question is about financing the game. I don’t tend to give opinions, I’m trying to stick to my experiences and I always played for the love of the game and I wanted to play football. I have never had an agent, but I think I am in the minority. I don’t think it’s the way of the world. Manchester City and Chelsea and TV money is the way of the world and that’s not going to change. It’s difficult for these kids.